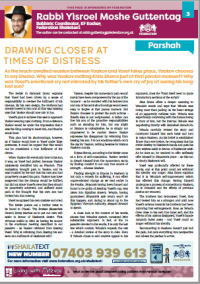 “And Yaakov lived in the land of Egypt” Rashi asks the famous question that relates to these opening words of our Parsha. 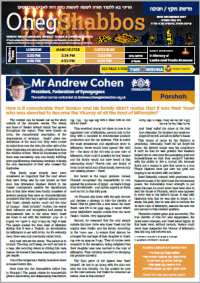 Why is this Parsha ‘closed off’? The Netziv in Ha’amek Dovor explains that Yosef had been driven by a sense of responsibility to oversee the fulfilment of his dreams. By his own design, the brothers had already bowed to him and all that was missing was that Yaakov should now join in too. The context can be teased out as the story unfolds of the dramatic events. 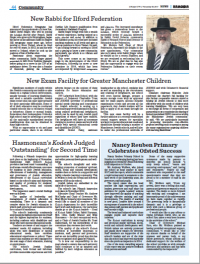 The status and fame of Yaakov Avinu’s family had spread throughout the region. They were known as Ivrim, the characteristic description of the descendants of Avraham . Rashi1 gives two definitions of the word Ivri: they were m’ever ha’nahar from over the river, the other side of the River Euphrates and secondly, m’benei Ever from the children of Ever. What he illuminates is that there was exclusively only one family fulfilling both qualifications, this being Avraham ’s family, the only descendant of Ever who crossed the Euphrates. 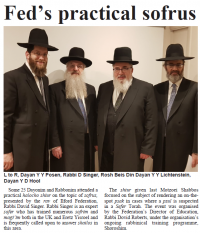 A CONFERENCE was held last Sunday to provide learning and chizuk to the Federation’s dedicated team of rebbetzins. The conference was held at the JLE and was extremely well attended. A conference took place last Sunday to provide learning and chizuk to the Federation’s team of dedicated Rebbetzins. The conference was held at the JLE and was extremely well attended. 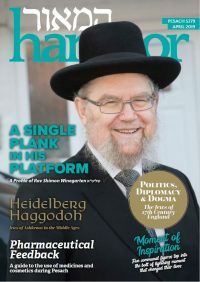 Rabbi Friedman authored a sefer, and as is common practice, put out a pile of ten of his seforim on a table in the lobby of a shul, with a money box next to the seforim and a handwritten sign saying “£9 a sefer.” Mr. S. Alec passed by shortly after, and having had a quick look at the seforim, came up with an idea. He took out a pen and crossed out the words “£9 a sefer,” and changed it to read “£10 a sefer.” He then stood back and waited. Over the next half hour, nine other people passed by, viewed the offer, placed £10 each into the money box and took for themselves a sefer. Mr Alec then took the last sefer for himself without paying. 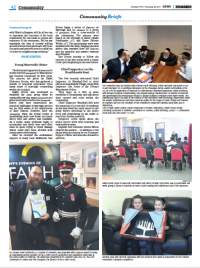 The Federation Beis Din hosted Rabbi Shmuel Yosef Shtizberg, noted mechaber and posek of Gur in Beit Shemesh, for a roundtable discussion on the challenges facing Jewish communities in the UK, vis a vis the application of halachah to contemporary household appliances. 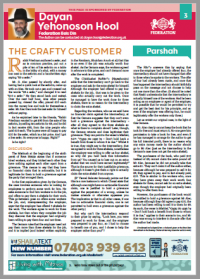 Rabbi Shtizberg, with his keen technical understanding, has advised leading manufacturers on matters of halachah and spearheaded the revolutionary project to design Shabbos-compliant smart water meters. 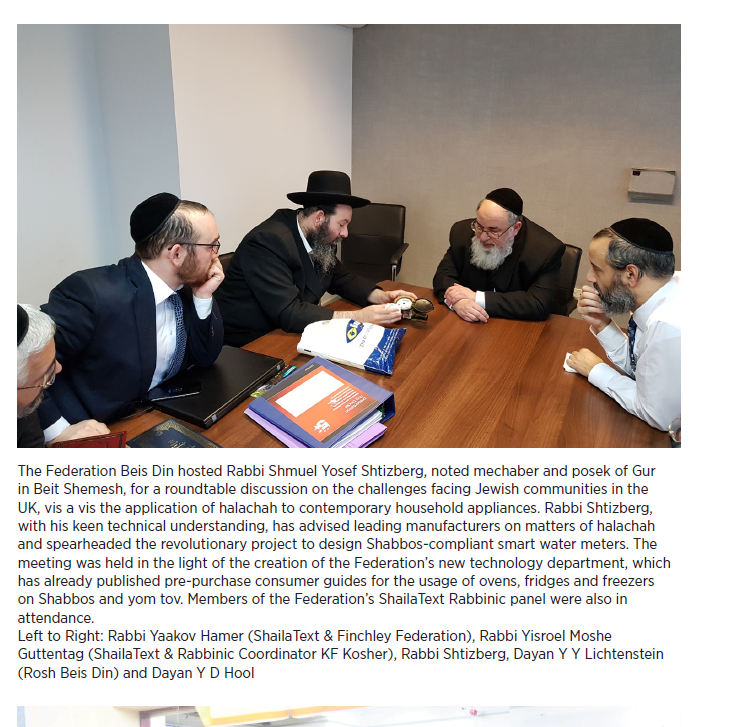 The meeting was held in the light of the creation of the Federation’s new technology department, which has already published pre-purchase consumer guides for the usage of ovens, fridges and freezers on Shabbos and yom tov. Members of the Federation’s ShailaText Rabbinic panel were also in attendance.